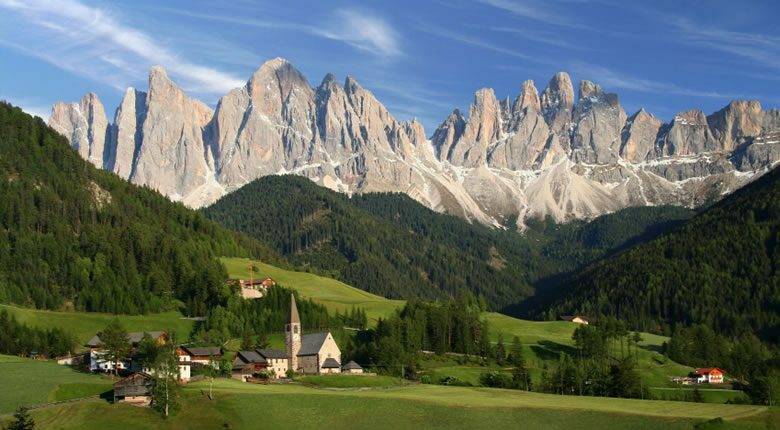 The dolomites are a mountain range located in north-eastern Italy, which form part of the Southern Limestone Alps. In 2009 the Dolomites were declared a UNESCO World Heritage Site. The Dolomites were also involved in a part of modern history – during the First World War, Italian and Austro-Hungarian forces battled for territory, forming trenches but at high altitudes. For centuries, there have been generations of ‘protectors’ of the Dolomites, and they still exist to this day. Locals, who live in villages amongst the Dolomites, also claim to have come across many fossils in the limestone, as many of the mountains were once covered by water and glaciers. So, where are the best places to drive? The scenic Dolomite Road, from Bolzano to the small village of Padola is one of the most beautiful drives you can find, not just in Italy, but in the world. Throughout the drive, there will not be a single moment where you don’t find something amazing to gawp at – unless you’re driving of course, in this case, concentration on these steep roads is paramount. We recommend not staying in your car throughout the entire journey, too. Italy is such a beautiful country, and it needs to be explored on foot. Walk into one of the many villages you pass along on the way and order some local food with a glass of wine or prosecco. For those who do not talk multiple languages, the locals will either speak German or Italian. Begin your journey in Bolzano on SS 241 and drive into Vigo di Fassa and connect to SS 48 and drive straight through to Cortina. From Cortina you can take another lovely drive through the Parco Naturale Tre Cime and at the other side, you will find Padola. A recommended side trip is from Canazei to Ortisei on SS 242 and down SS 641. Stop off at Malga Ciapela and take the cable car up the mountain at a height of 3,265 meters or 11,000 feet. Well worth the detour. Canazei is a small town halfway between Bolzano and Cortina is a good place to spend the night.